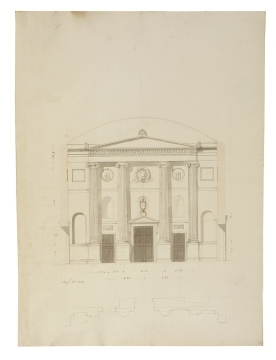 Drawings 34 to 36 show essentially the same design as drawing 33 but with variations in decoration and, in drawing 34, an alternative design for the pediment. The plans included in drawings 35 and 36 show the old wall of the previous Accountants' Office flush with the wall of the new Accountants Office (red wash). The doorway at the east end of the new Accountants' Office aligns with the doorway of the old office. The latter is turned into the Bill Office. The central and left doors in the elevations lead, respectively, to the Bill Office and a stairwell. The right door is blind. A note in drawing 36 instructs the design to include flower paterae modelled on a soffit from the Temple of Mars (Ultor, Rome). The final design included paterae such as these. 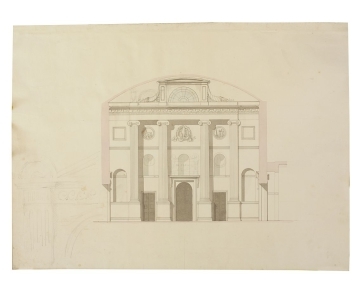 At his Royal Academy Lectures, Soane presented a drawing of the Temple of Mars (SM 19/8/5) as well as a detail of a soffit from the temple (SM 26/3/7). 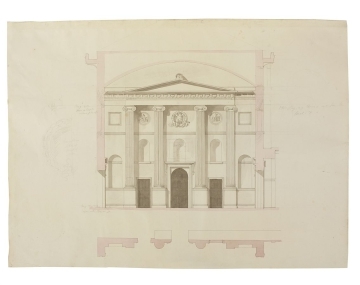 In Lecture II, he praised the temple's remaining columns, capitals, entablature and architrave, stating: 'There is such a taste in the composition and such correctness in the execution, as makes us lament the loss of any part of this exquisite work' (J. Soane, ed. A.T. Bolton, Lectures on architecture, 1929, p.37).